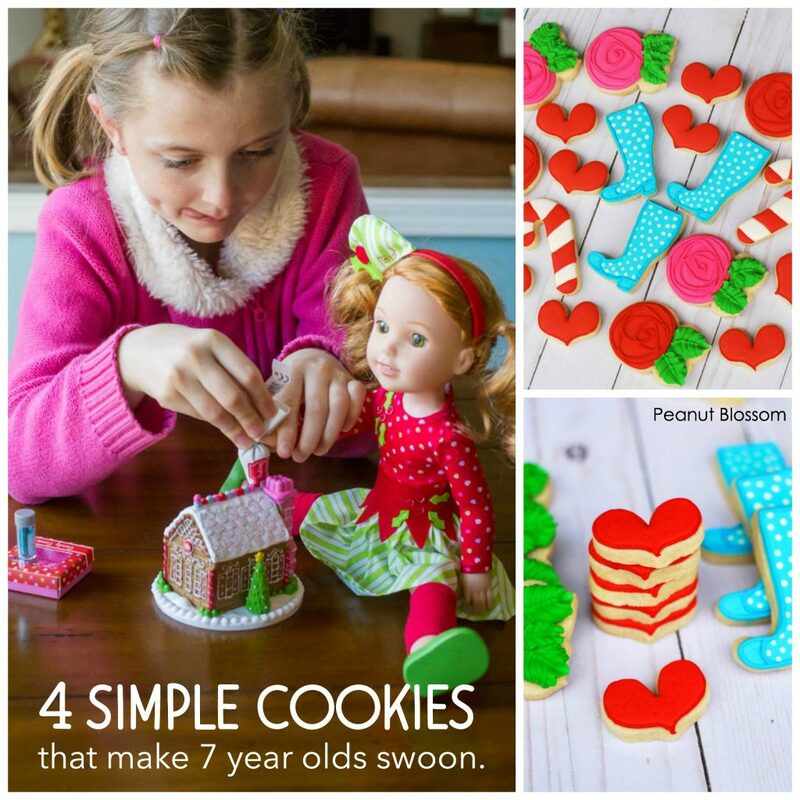 The girls and I looooove eating fancy sugar cookies, but actually trying to decorate them? Um, No Way. My first attempt at making a batch of royal icing was so pathetically disastrous it belongs on an episode of Bloopers & Practical Jokes. Then along comes Little Pea’s love of all things fancy and her obsession with the cutie pie WellieWishers dolls by American Girl. I couldn’t resist giving it another go to plan a special holiday surprise for my tiny baker. The color palette is simply perfect! Red, white, pink, blue, and garden green. I love how festive the cookie tray feels, all bright and merry. Wait till you see just how easy it is to decorate them. Any one single cookie may not look so “fancy,” but then you put them all together on a tray and WOW! But first let’s look at the original inspiration for the cookies. 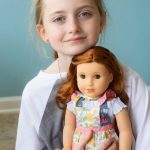 Have you heard of American Girl’s WellieWishers? They are so insanely precious, I’m not sure who was more excited about them — Little Pea or me! As with every American Girl doll, the WellieWishers have their own line of books that are just perfect for early readers like my Little Pea. The plot lines are much more approachable for younger girls and feature things like loosing a tooth, caring for garden creatures, hosting parties, and tackling stage fright before performing a garden performance. 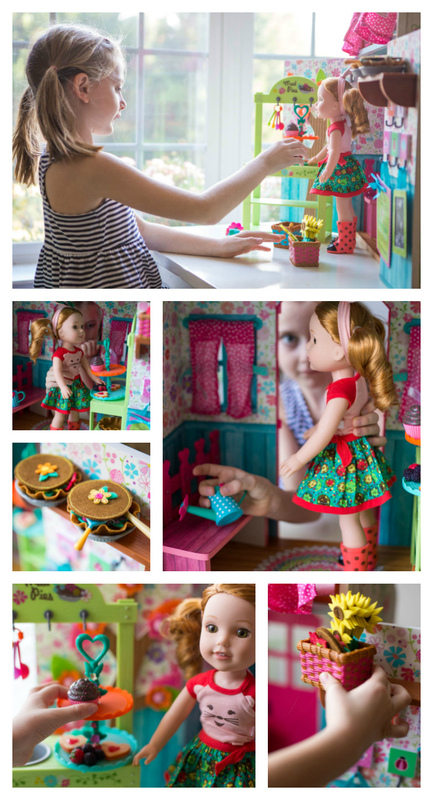 American Girl sent us the WellieWishers Playhouse to review and I was thrilled but not surprised to discover that the details from the entire WellieWisher world were matched right down to the tiniest little accessory. Some of the tiny pieces feel almost handmade because they are made with a durable felt material. It gives a much more cuddly feel to the overall toy set. But what we loved most is just how cute the 5 main characters from the line are! 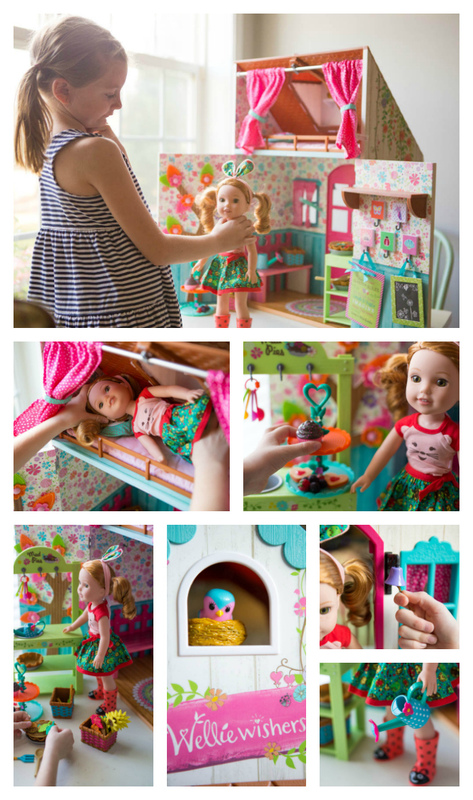 Little Pea couldn’t decide between Willa and Ashlyn for her first doll. But Willa won out because of her adorable hedgehog themed shirt and ears headband. Then they just had to come out with a little red and green elf outfit for the dolls and several precious Christmas themed accessories. We snapped up the gingerbread house decorating kit to add to Little Pea’s set and she’s been playing with it constantly. Let’s take a closer look at these cookies. I was shocked to discover just how easy they are to decorate! 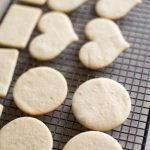 Step 1: Bake a batch of sugar cookies and let them cool completely. We tried this sugar cookie recipe and it was perfect. Made just the right amount of cookies and rolled out really easily. Get the heart shape cutter here. Get the boot shaped cutter here. Get the flower shaped cutter here. Get the candy cane cutter here. This was the part that scared me the most, but honestly it is so super easy. We used this royal icing recipe here to make a big batch ready for tinting. Don’t forget to get a container of merengue powder before you start! Separate the icing into 5 separate containers and tint it: red, light blue, green, and pink. You can leave the 5th container white. Ok, I lied. THIS is the part that scared me the most. I don’t have a very steady hand and tiny details make me so nervous. I love that Chrissy’s designs don’t require a lot of detail work. They are just bold colorful cookies that look great together! This is actually the perfect design for introducing sugar cookie icing! For each cookie, you want to pipe the edges of the cookie with the thicker royal icing before you water the rest down for flooding. 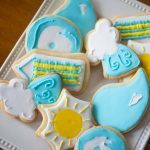 If you’re not familiar with piping icing vs. flooding icing, check out this full explanation here. ROSES: To make the leaves on the roses, use thick piping icing with a Wilton tip #67. Reserve some piping consistency icing before you water it down for the final swirl decor on the flower. Only pipe that decoration on after the flooded icing completely dries. BOOTS: Reserve a little piping icing before watering it down so you can finish the details. To make the polka dots on the boots, flood the boot with blue icing and then IMMEDIATELY pipe white flooding icing with a Wilton tip #2. Then let completely dry before adding the final piped edges to the toes. The best part about making sugar cookies is that they last for so long. You can make them well ahead of when you need them for your party and just store them in an airtight container. 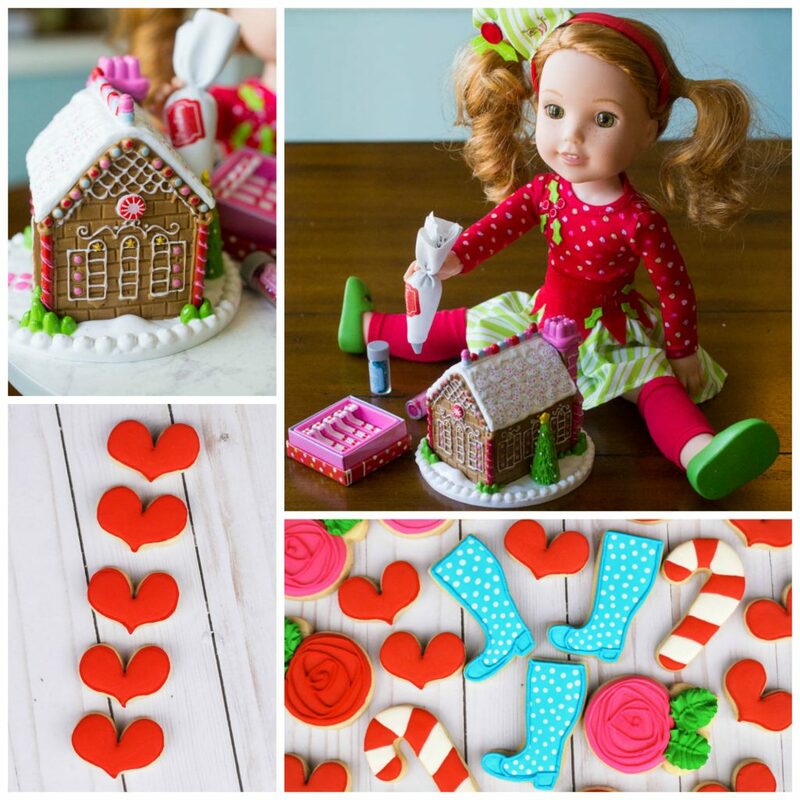 Wouldn’t these be the cutest little holiday party favors for your daughter and her friends? Host a simple hot cocoa tea party with our favorite hot cocoa and serve these for a snack!